Extremely helpful in relieving severe dry mouth symptoms: burning, sore tissues, cotton palate, and swallowing dificulties. Use as often as necessary. Works great under dentures. 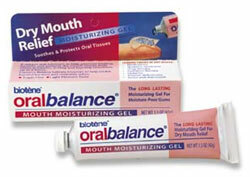 A new type of oral lubricant specially formulated to actually help promote healing as it moistens. Contains the Biotène protective salivary enzyme system which helps inhibit harmful bacteria. Use whenever necessary to relieve dryness. Using a clean fingertip, apply a one-half inch ribbon of gel onto tongue, add an additional amount of gel on affected areas, can be massaged into gums. It is safe to swallow excess gel to assist in throat lubrication. Repeat several times daily as needed. Laclede, Inc., 2030 East University Drive, Rancho Dominguez, CA 90220. Tel: 310-605-4280; Fax: 310-605-4288.